Rambi Rumble is the twenty-second level of Donkey Kong Country 2: Diddy's Kong Quest. It is the sixth area of Krazy Kremland. 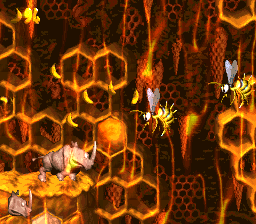 The first half of this level generally involves climbing around the hive, which can be difficult due to the stickiness of the honey and any enemies that get in the Kongs' path. Similar to Hornet Hole, the primates can climb walls using honey that is splattered along it. For the second half, the Kongs transform into Rambi and travel to the level's bottom floor. Near the end of the stage, Rambi finds himself being chased down by King Zing for the remainder of the level. 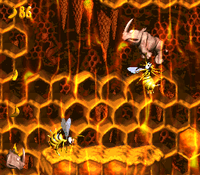 The rhinoceros is able to use his ability of bouncing on Zingers and running over honey to dodge the giant wasp. Other enemies here include Zingers, Kutlass, Klampons and Krunchas. Diddy hangs onto a wall covered in honey. The level begins with a pathway leading to a Kutlass near a raised area. Honey is splattered over the raised area, and a group of Zingers fly in a large circle, similar to Boo Buddies. A DK Barrel wobbles between them. A gap with a long wall on the other side of it is ahead. This wall is covered in honey from top to bottom, allowing the Kongs to stick to it and climb. As they climb it, a Zinger stands in their way. Soon, they can reach a floating platform to the right of the wall with honey on the side of it. They can use this honey to climb to the top of the platform, which has a Klampon on it. Another large platform floats ahead with honey on the side of it. The primates must travel on top of it while dodging a second Klampon to reach a hook. They can use it to assist them in reaching a set of two walls above, which is covered in sticky honey. After the primates climb most of the wall, avoiding a Zinger on the way, they come up to a Barrel Cannon that rotates when entered. With good aim, they must shoot upwards between two Zinger to more honey on the walls. If they climb the remaining part of the honey-covered walls, they can reach a flat area of land with a Klampon on it. A DK Barrel is above the foe. Honey walls cover the walls of a gap found to the left of here. The primates must climb down the walls of the gap while dodging a total of three Zingers to reach another solid area of land with a Klampon on it. There is an abyss farther west of here with a wall of honey on the other side of it. A pair of Zingers fly around the wall, along with the wall found across from it higher in the area, as the heroes climb. Soon, they can reach a Barrel Cannon that they must utilize to blast upwards. 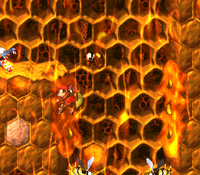 The Kongs can reach more honey on the walls with the barrel. If they crawl to the top of the wall, they can find a gap ahead of them with another wall of honey on the other side of it. A Zinger is at the bottom of the wall. A Kutlass also waits to attack at the top of this wall on the solid ground. The letter O is in a gap near the armed enemy. There is a honey wall with a Zinger at the bottom of it on the other end of this abyss. Once the wall is climbed, the heroes can find a solid area of land with the Star Barrel above it. Rambi bounces on a Zinger. A large gap is ahead that the Kongs cannot cross with a normal jump. Honey splattered along the walls on the sides of the gap can be clung onto to avoiding falling. A Kutlass is located ahead of here, along with a passage leading into a cavern-like area in the hive. An Animal Barrel is located in the cave, but it is high in the air. The heroes must jump from a honey wall to reach it. When they access the barrel, they are turned into Rambi the Rhinoceros, who must leave the cave area through a different passage found to the right. On the outside of the cave, Rambi can find a DK Coin against a honey wall and a Zinger in a tight space blocking his path. He can slam through the Zinger with his strength. Two Zingers float in a gap ahead of here. The abyss is too big to cross with a normal jump, but Rambi can bounce on the wasps to cross. A gap leading into a lower area is ahead. A Zinger is also above it, who can be bounced on to reach a DK Barrel. If Rambi hops into the previously mentioned gap, he can enter a lower area with a Kannon at the beginning of it. This foe shoots barrels at the hero. Another abyss is nearby that Rambi can pass by bouncing on a Zinger. A flat pathway splattered with honey is straight ahead. Zingers float above it with a the letter N above them. A Kannon also shoots kannonballs across the area. Zingers fly in an additional abyss located nearby. Once the rhinoceros bounces on them to travel over the gap, he can find a passage leading downwards, which is guarded by a Zinger. He lands in another lower area when he falls into here. A red, indestructible Zinger is near the end of this area to the right, floating next to another passage. Once the hero drops into this passage, he is greeted by King Zing, who begins to chase him. At the beginning of the chase, Rambi races towards a few Zingers found floating only slightly above the ground, which has honey on it in some spots. The rhinoceros can stomp through honey and then approach a large abyss that he must cross by bouncing on the three Zingers found in it. A passage leading farther downwards is ahead of here with more Zingers guarding it. In this lower area, more Zingers can be seen along the ground. A large abyss is in the center of here with four Zingers in it. The rhinoceros must use his abilities to bounce on the Zingers so he can cross the abyss. There is one last passage at this gap with a red Zinger in front of it. The hero can fall into it to reach the lowest part of the hive, where two more red Zingers stand in his way. After the hero travels over the flat area and passes these Zingers, he can reach an Auto Fire Barrel that blasts him to a raised piece of land that King Zing cannot get onto. A No Animal Sign is here that causes Rambi to turn back into the primates. The End of Level Target is near here. The level is complete when it is hit. A prize can be won from hitting this target after shooting to it from a nearby Barrel Cannon. K: The heroes should drop into the gap after the first Klampon to reach the letter K found under some hooks. O: The letter O is in the first gap after the second Kutlass in the level. N: Rambi must bounce on a few Zingers found above the second Kannon in the level to reach the letter N.
G: The letter G is won of the prizes that can be won when blasting to the End of Level Target from the Barrel Cannon located just above it. The heroes must hit the target at the right time to get it. The Kongs begin the first Bonus Level. When the group reaches the second spinning barrel in the level, they should shoot to the next platform with it. From there, they can see a lone banana floating in mid-air to the left. When they jump to it, they uncover a hidden hook. After this is done, they must jump to the honey wall on the left and climb up, where they can see an entryway to the first Bonus Level. Here, the primates have to climb up to the top of the area using walls covered in honey. A Kremkoin waits at the top of the stage for them to collect, but they only have 15 seconds to grab it. At the end of the level, Rambi should not enter the barrel that shoots him to the No Animal Sign. Instead, he must dash into the wall next to it and break it open. When he walks in the new entryway, he is taken to a Bonus Level, where he must race to the bottom of the area and defeat several Zingers and Krunchas on the way. If he reaches the exit before the time limit of 15 seconds runs out and after he defeats all of the enemies, a Kremkoin appears for him to collect. Immediately before the Kongs enter the room with the Animal Barrel in it, they should jump and grab onto a hidden hook. They have to climb above the room, and then drop down to the other side of it, where there is a honey wall with a DK Coin next to it. After the heroes reach the platform with the second Klampon of the level on it, they should drop down to the right to grab onto a hook. If they jump to the right again, they land in an Auto Fire Barrel that can shoot them directly to the Golden Feather. Near the letter O, the heroes meet a Kutlass with a camera icon over its head. They should defeat it to get a photograph of a Kutlass for the sixth page of their scrapbook. Dixie celebrates at the end of the level in the original version of the level. Rambi runs from King Zing in the Game Boy Advance version of the level. Oddly, Screech's theme song, "Bad Bird Rag" plays in the Game Boy Advance remake of Donkey Kong Country 2 while King Zing is chasing Rambi through the stage, despite the fact that the original song is still present in the sound test menu. It is unknown if this was a mistake or if it was intentional.